A fantastic DVD filmed with Jill, who taught with Rainbow Silks for many years and is also a well-known silk painting author. Very comprehensive, the DVD format is split into lessons. Covering a wide range of techniques, you can learn a great deal from Jill's demonstrations. 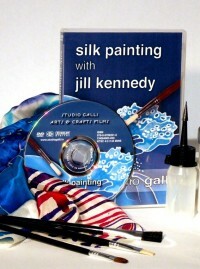 To see video taster from Jill's DVD see Youtube, and search for "Silk Painting with Jill Kennedy" - click on any of the Galli Films links.